An economic slowdown and the rise of a range of market disruptors will impact the commercial real estate industry in 2019, according to speakers at NAIOP New Jersey’s Annual Meeting and Commercial Real Estate Outlook. 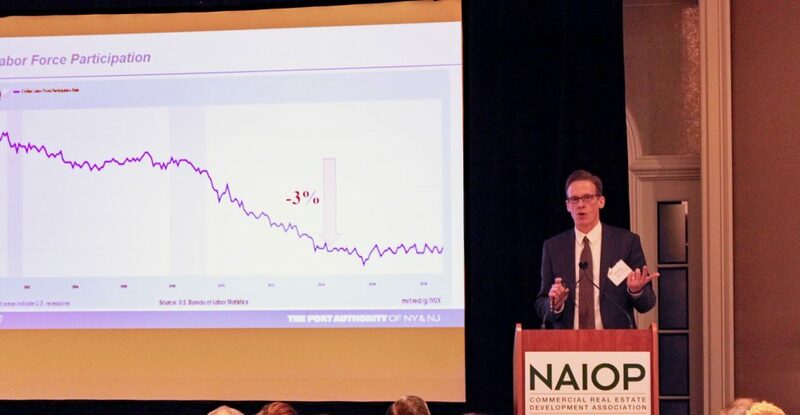 Port Authority of New York and New Jersey Chief Economist Alexander Heil serves as keynote speaker at NAIOP NJ’s Annual Meeting and Commercial Real Estate Outlook. Over 325 industry professionals attended the event Jan. 24 at the Short Hills Hilton, which included the election of the commercial real estate development association’s 2019 officers and trustees. Alexander Heil, chief economist for the Port Authority of New York and New Jersey, provided an overview of the economic outlook for 2019. “2018 was a great year,” said Heil, citing highlights that included a strong GDP due to consumer spending and solid employment growth nationally and regionally. Larger companies looking to create workplace efficiencies are also considering co-working spaces, which means providers need to ensure their buildings offer the dynamic features that attract corporate users.